You can use the Insert > Envelope feature, but this is simpler. Just download this file to your computer. Then every time you want an envelope, just double-click it, and type in the information you want. Here are the two things you need to do. One: Be sure that there are envelopes ready to feed into your printer. Two: When you've typed in the information, make sure that your printer is set up correctly to print to Envelope 10. So choose File > Print, select the printer to print to, click the Properties button next to it, and you'll see the setup window for that printer. In a tab called Paper or something like it, you'll find a field where you pick the paper size. (It varies between printer brands.) Instead of Letter, be sure you select Envelope 10 instead. This is for normal fullsized envelopes. Click OK, then click OK to print. 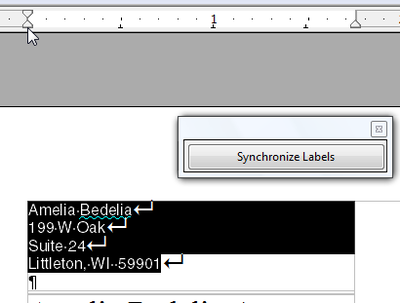 In OpenOffice mail merge documents, you see the field names like Name onscreen, not the data like Bob. The data appears when you print. I just wanted to clarify something since I hate to see people thinking they're doing something wrong when they're doing it right. Here's an example using labels.� This is how it's supposed to look. You won't see the data onscreen, you'll see the field names like first name. When you print, the correct data will appear. 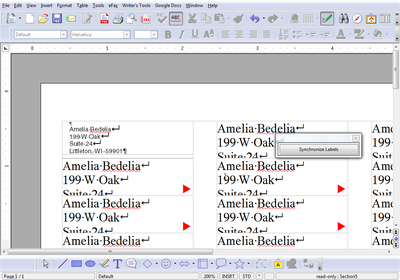 If you don't know want to print all the data, you can pick the ones you want in this� window. Just choose File > Print, click yes that you want to print a form letter, and then select the records you want in this window. Select the first record, hold down Ctrl and select the next one, and so on. Labels don't always match up perfectly, especially those little return address labels. What can you do, besides prayer and fasting, and wasting labels? I try to just give the labels some room to make mistakes without screwing up my text, by putting some space around the label text. It's nothing all that complicated, but I hate to think of dealing with labels without it. See also this entry, another way of tweaking labels. First, you make your labels. Do whatever you need to do, but on the Options tab, select Synchronize contents. 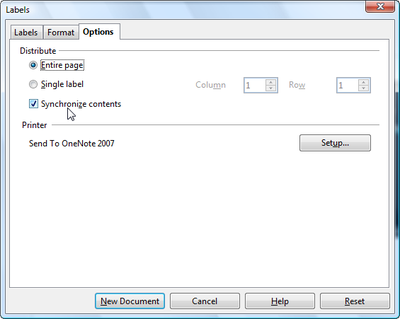 Then click New Document to create the label sheet. You'll get something like this, the red arrows particularly with very small labels where the default font size, 12, doesn't fit. 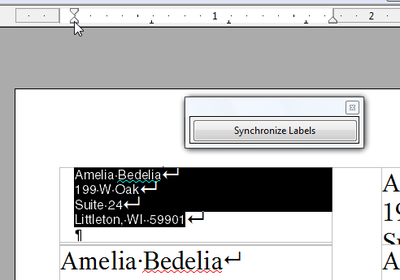 Next, select the upper left label and make the font as small as you need to to fit the content on. You might need to just select a line or two at a time or select All. Apply a 6-point font or less if necessary, and I like to use a sans serif font like Nimbus Sans L or Helvetica. Now you can see all the content. With the first label selected, find the little hourglass shaped icon on the ruler, marking the left margin. And drag that icon to the right to give the text a little breathing room on the left. Now that you've given it room on the left, give it room on the top. Click to the left of the first line of text in the first label and press Return. Now with your cursor in the new blank line, type in the font size box, perhaps a 4, and press Return. And now there's a nice scosh of blank text above the content, too. The label is how you want, so just click that Synchronize button to make all the labels like the first one. Used to be, it was hard to just print the records you wanted to print in a mail merge, in OpenOffice.org mail merges. What if you're mad at Marie, though, as well as Jean, John, and Xavier, and just want to print a holiday letter to Bob and to Kathy and the other 119 people in your list who you're still speaking to? You had to either go through the HUGE and complex mail merge wizard, or just print a letter each for Marie, Jean, John, and Xavier, and throw them away. However, in 2.something of OpenOffice.org, you can just Ctrl - Select the records to print. 1. Make your mail merge document: labels, letter, envelopes, whatever. 2. Choose File > Print and say Yes, you want to print a form letter. NEVER mark the checkbox. 3. In the window that appears, you can scroll down to view the database and table you're using at the left side. This isn't necessary but it might help you feel more organized. 4. Click on the light gray box next to the first record you want to print. Hold down Ctrl and click on the light gray box next to the next record you want to print. And so on. You'll see that at the left side, Selected Records is now marked. 5. Now just select Printer or File to print as you normally would, and click OK. The normal printing window will appear if you select Printer.